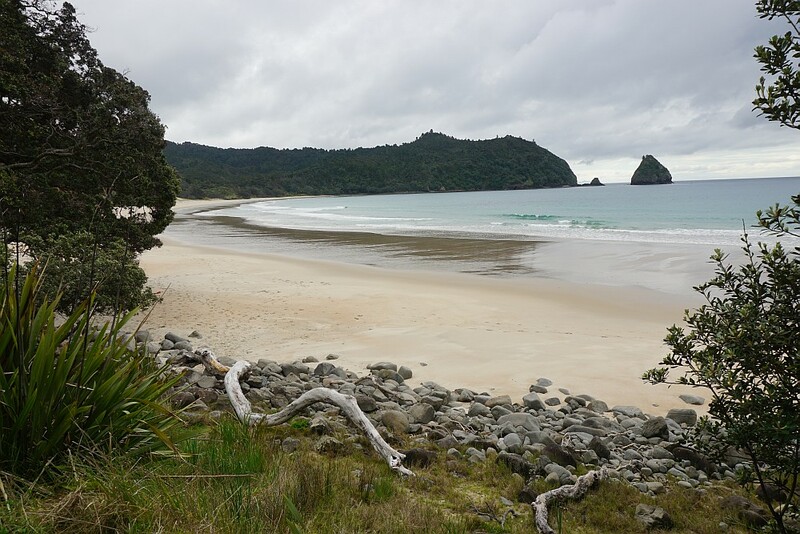 New Chums Beach, in Wainuiototo Bay, is only accessible by boat, or by foot from Whangapoua Beach. 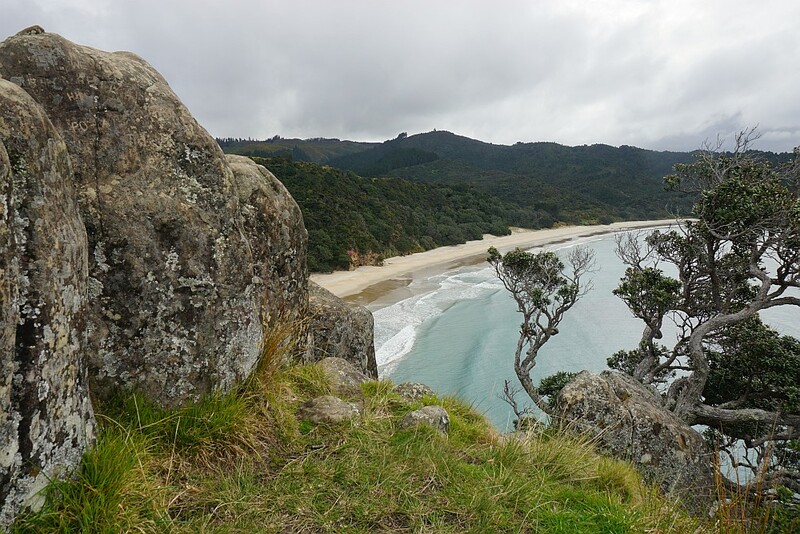 The walk from Whangapoua Beach is relatively easy, but there is a rather difficult but short side track to the 72m high summit of Whangapoua hill at Motuto Point for excellent views of New Chums Beach and Whangapoua Beach. New Chums Beach has been in the news recently, with protests over plans to subdivide land for holiday homes near the beach. Presumably this would be the farmland which is visible on some photos, but which is not visible from the beach itself. 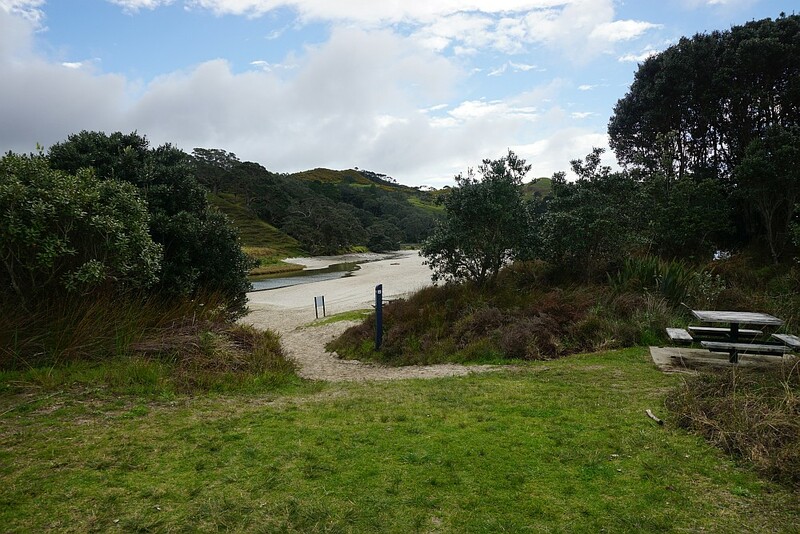 There is a small parking area and basic toilet facilities at the end of Mangakahia Drive, where the walk to the beach starts. 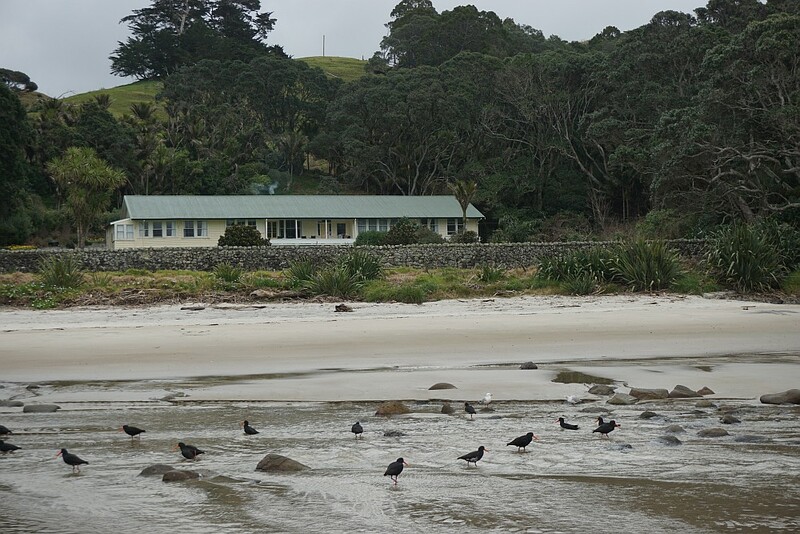 The first part of the walk is through William Mangakahia Lagoon Reserve, followed by a crossing of a stream, walking on the rocky foreshore and a track alongside it, to a small saddle at Motuto Point connecting to New Chums Beach. 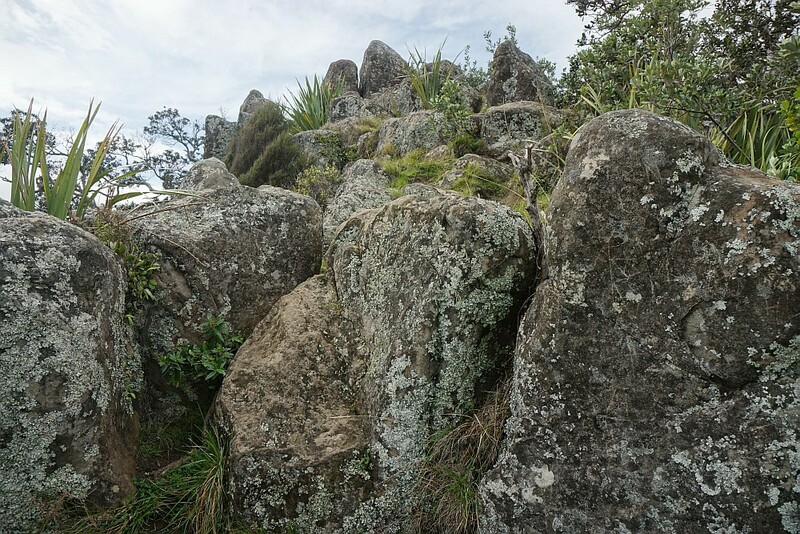 The track to the summit of Whangapoua starts at the highest point of the saddle, and is a rocky, rough, and very steep climb to the summit. From the parking area on Mangakahia Drive to New Chums Beach is about 1.1 km, and took about 20 minutes. 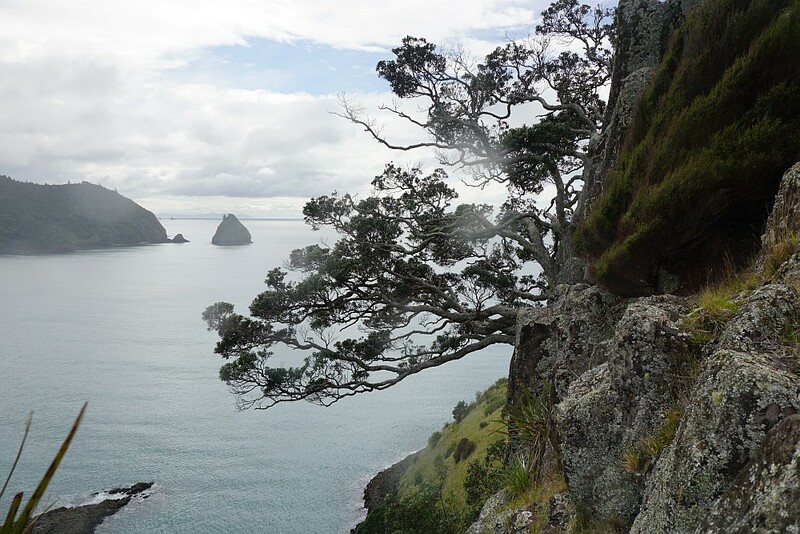 The side track to the summit of Whangapoua took about 25 minutes for the return trip. The walk to or from New Chums Beach should not be done 2 hours on either side of high tide, since the track is more or less at high tide level for part of the walk. 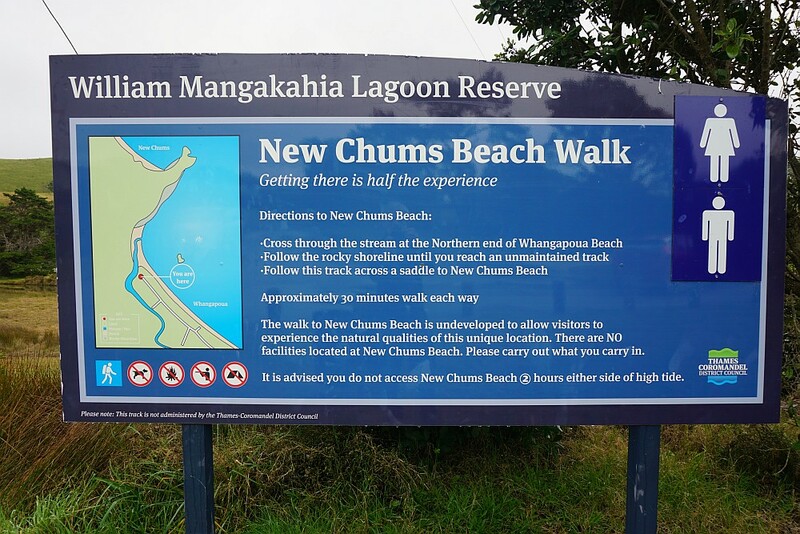 There is limited information about the walk to New Chums Beach on the DoC web site. 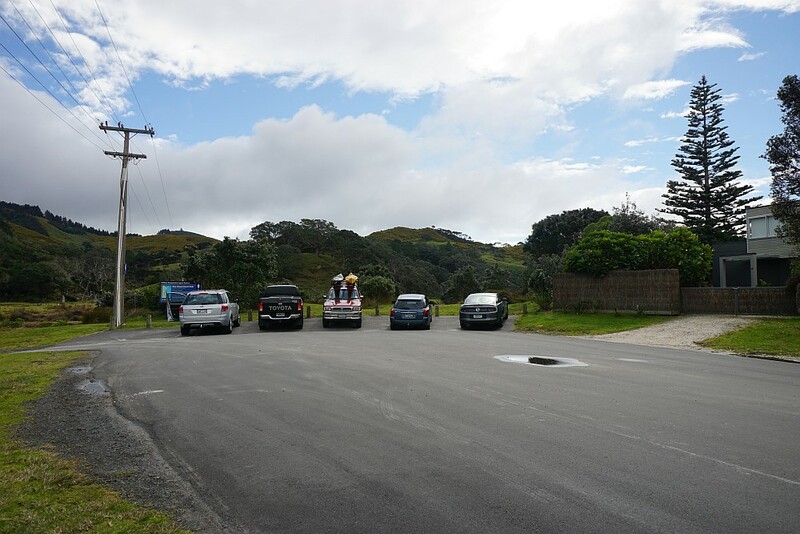 The parking area at the end of Mangakahia Drive. The information panel by the parking area. Note the advisory not to walk 2 hours either side of high tide. The walk starts at the carpark, continuing over the stream seen in the centre of the photo. The stream has an active birdlife at times. 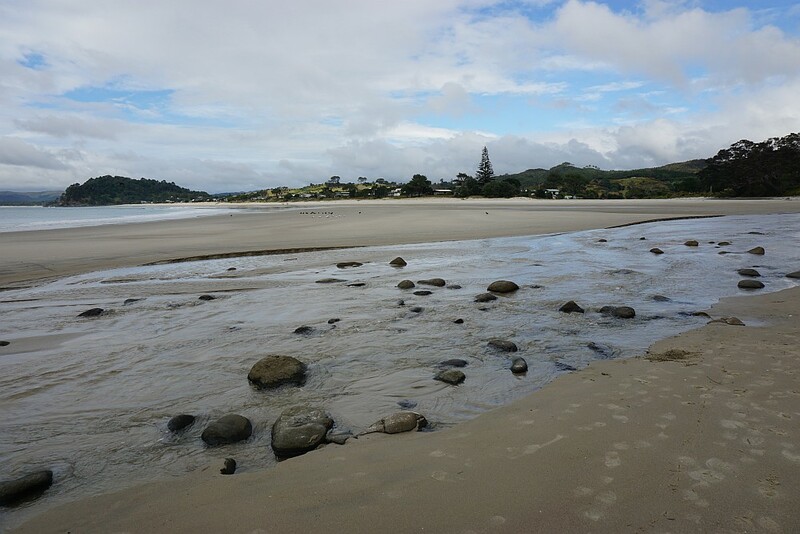 Looking back at Whangapoua Beach and Raukawa Pa site at Te Rehutae Point after crossing the stream. With the stream at this level it is possible to cross on the rocks without getting wet feet. 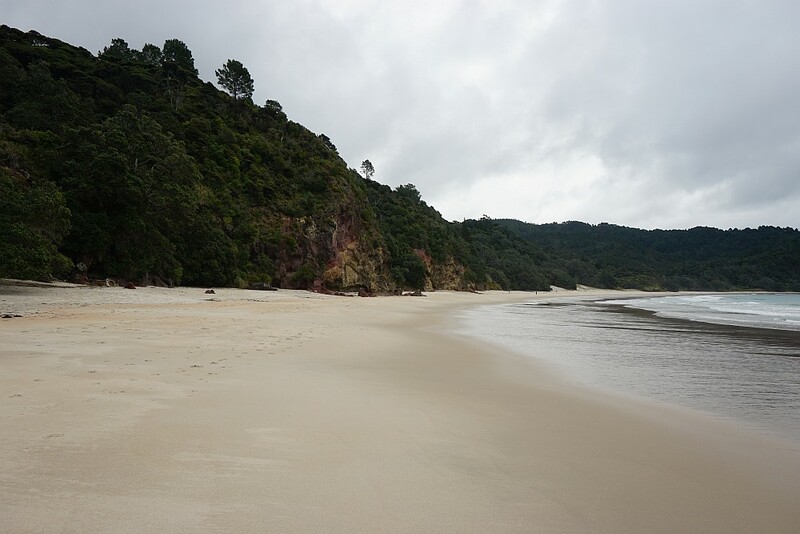 The ‘track’ on the rocks follows along the vegetation line at the high water mark for about 700 m, although for part of this distance there is a track running parallel and close to the beach. 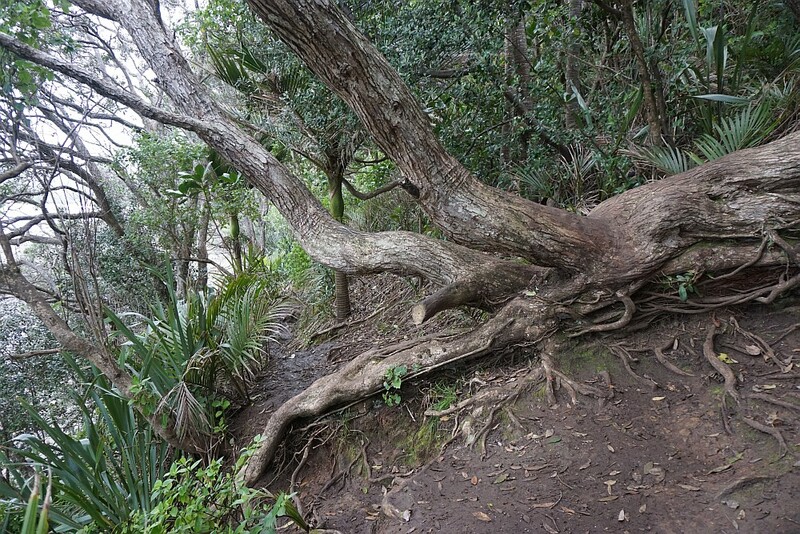 The track alongside the rocky beach is uneven in places, and has a few obstacles along the way, such as this fallen pohutukawa. 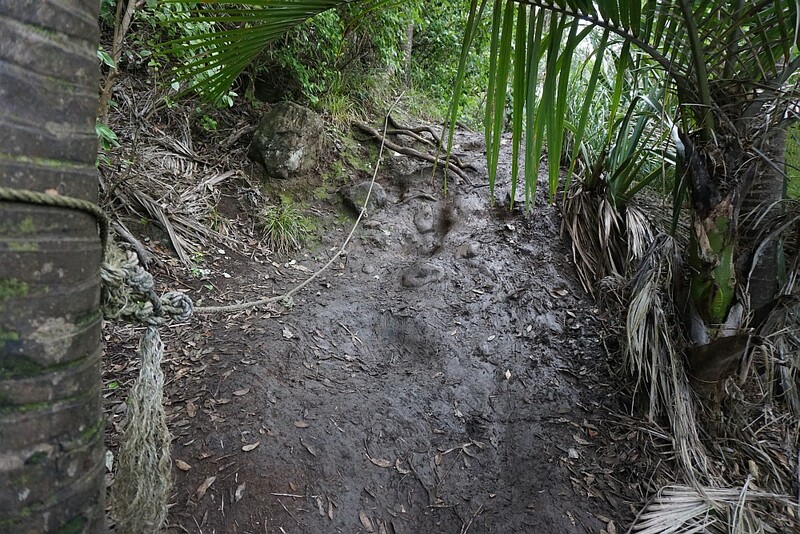 Someone has been good enough to install a rope handhold for the steepest and muddiest part of the track. 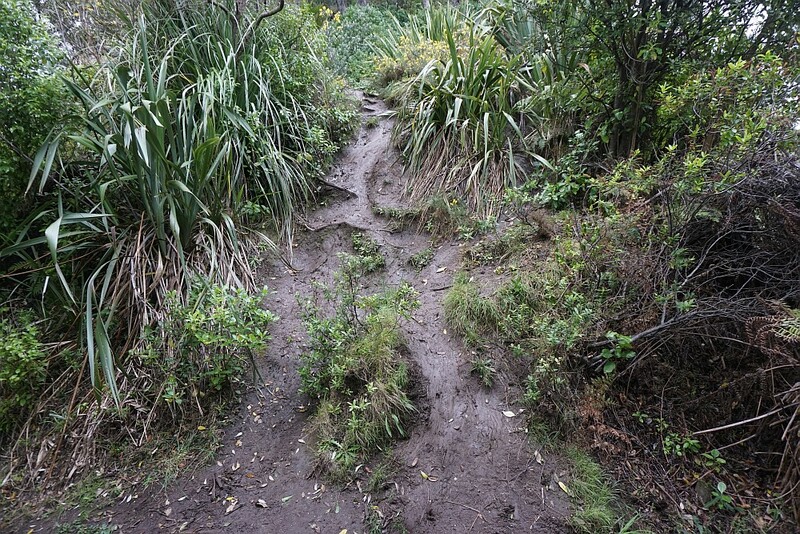 The start of the track to the summit of Whangapoua. The track only gets worse from here. Nearing the summit, with steep dropoffs to both sides, the track continues through a rocky outcrop. 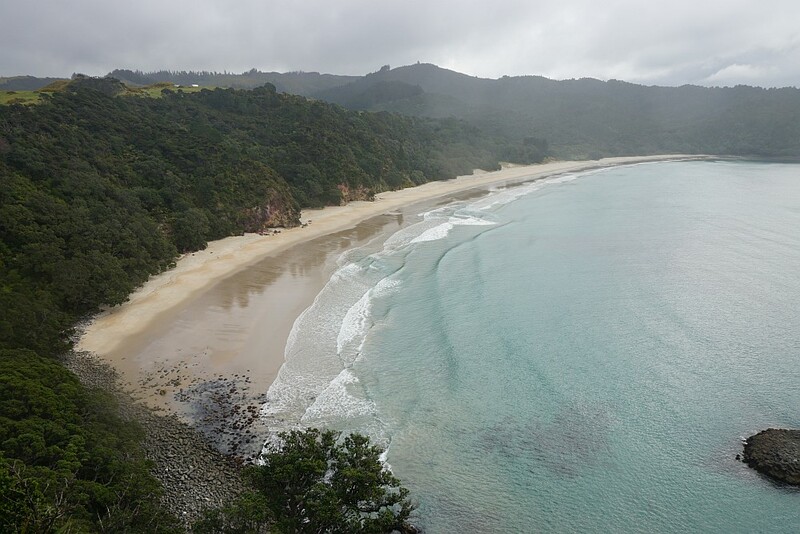 Looking down at New Chums Beach and Wainuiototo Bay from the summit. The pohutukawa cling to the steepest and rockiest part of the summit. 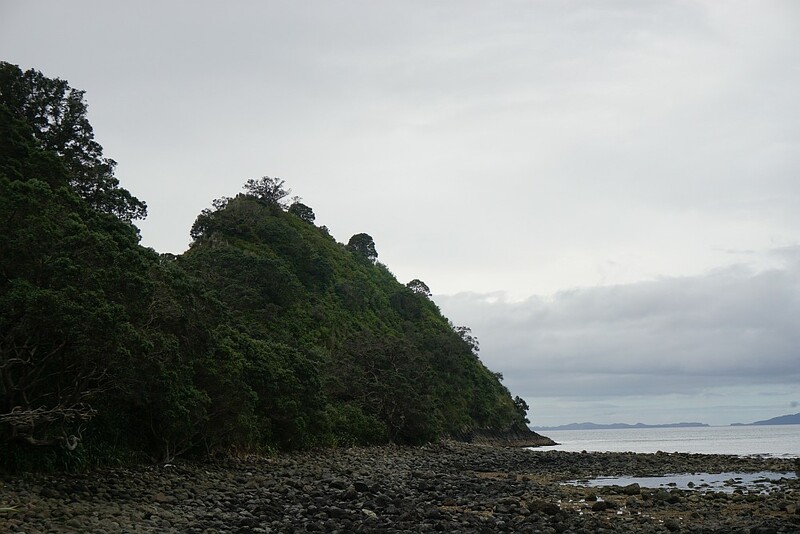 The small Motukopu Island can be seen clearly. A gentler slope with a grass area opens up on the far side of the summit. 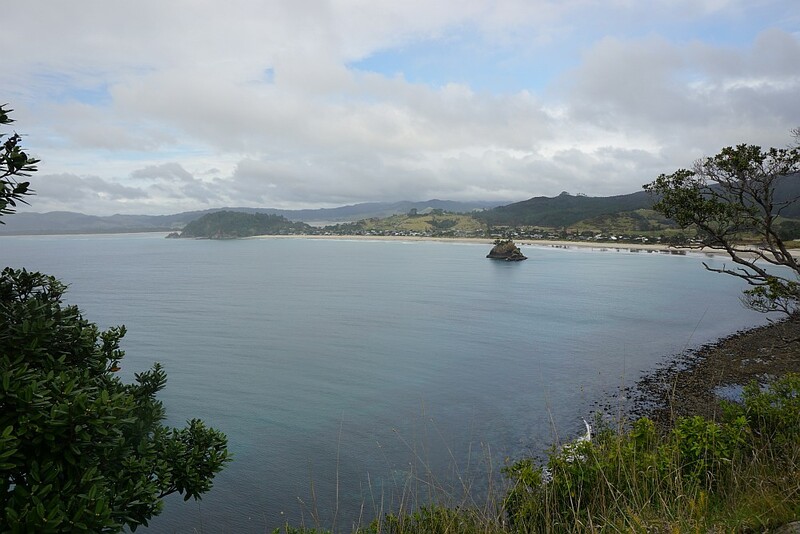 Looking down at Whangapoua Beach and Raukawa Pa site and Te Rehutae Point. The boulders at the summit, looking down on New Chums Beach. 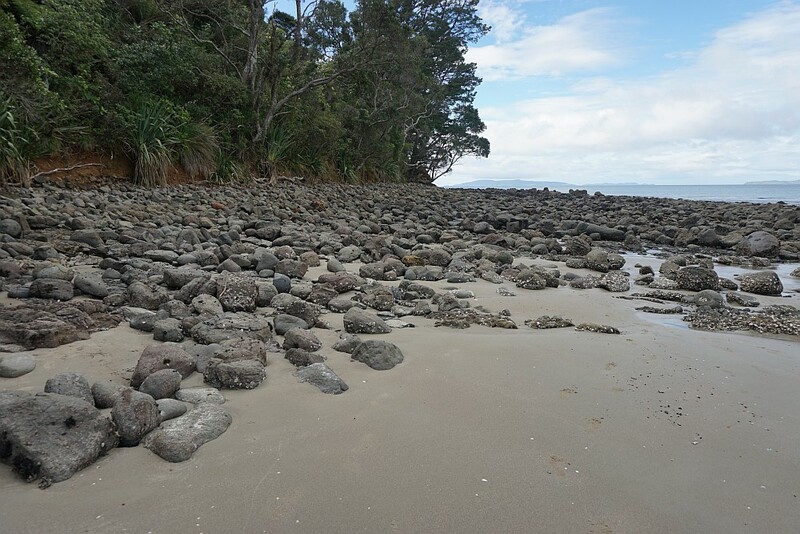 The Motuto Point end of New Chums Beach is rocky. The remainder is sandy. 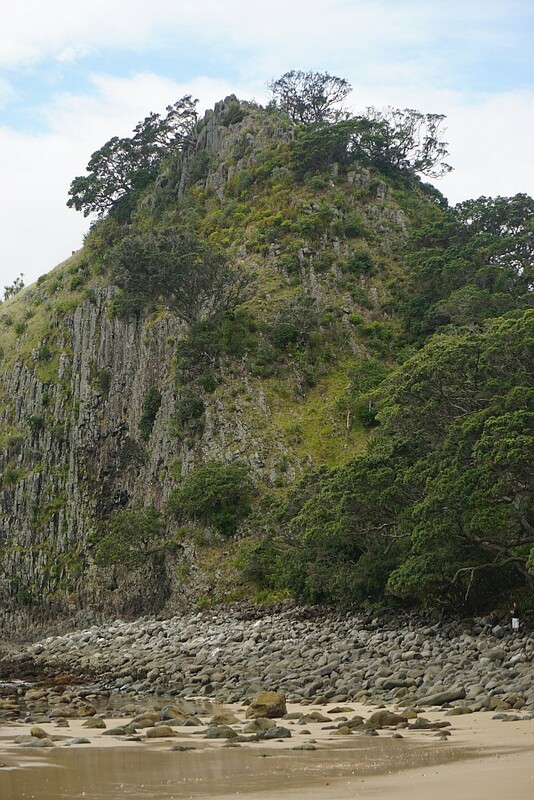 The face of Whangapoua hill, with the rocks and pohutukawa trees at the summit, seen from New Chums Beach. 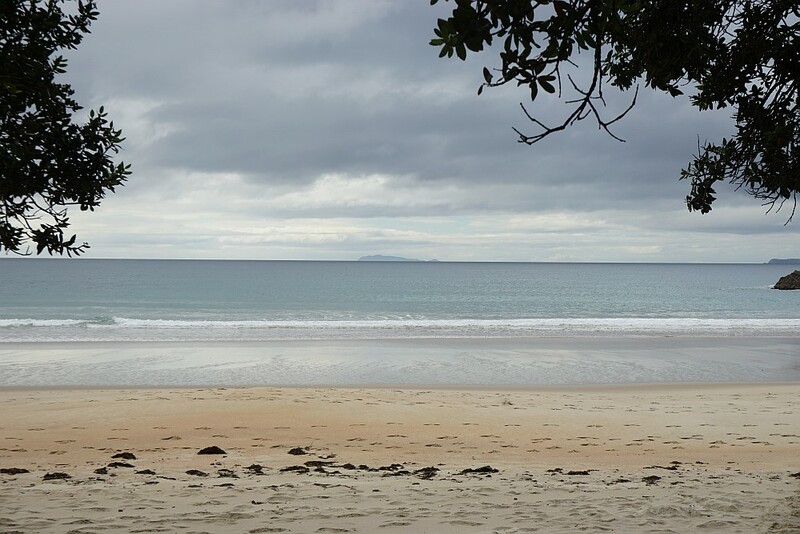 Being a showery and cool winter’s day, New Chums Beach was almost deserted. Looking from the beach out to Great Mercury Island. 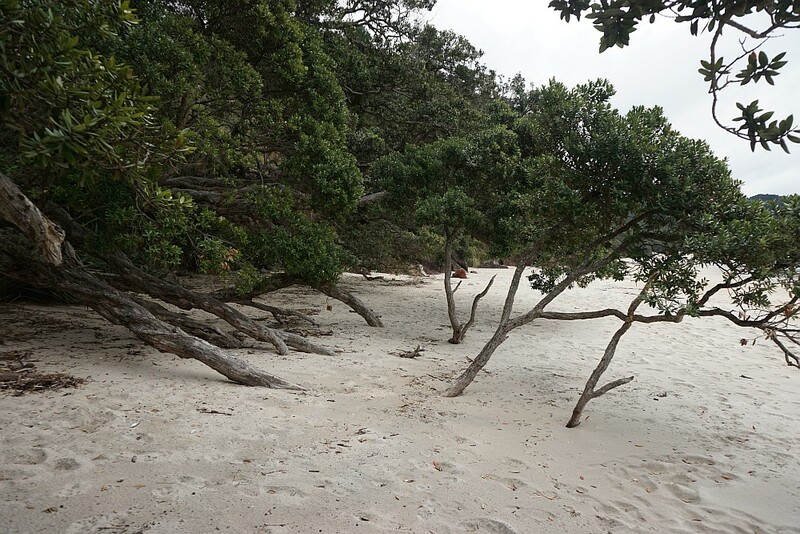 These pohutukawa branches grew so low that they ended up partially covered with sand. 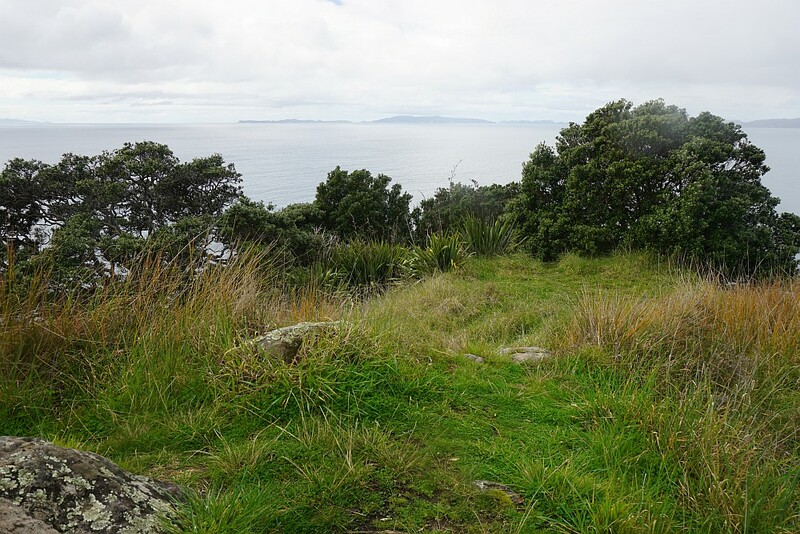 The gentler slope and grass area on the north-eastern slope of Whangapoua hill, with Motuto Point at the far left. Whangapoua hill seen from Whangapoua Beach. 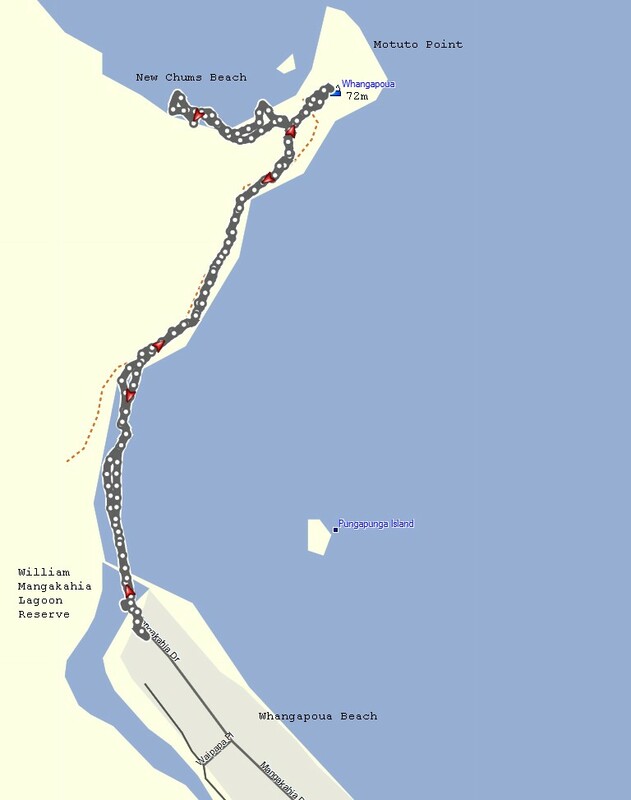 The GPS track log shows the route walked, including the short side track to the summit of Whangapoua. Total time was about 1 hour 20 minutes, with the short side track taking 25 minutes, and the direct route to the beach about 20 minutes each way. 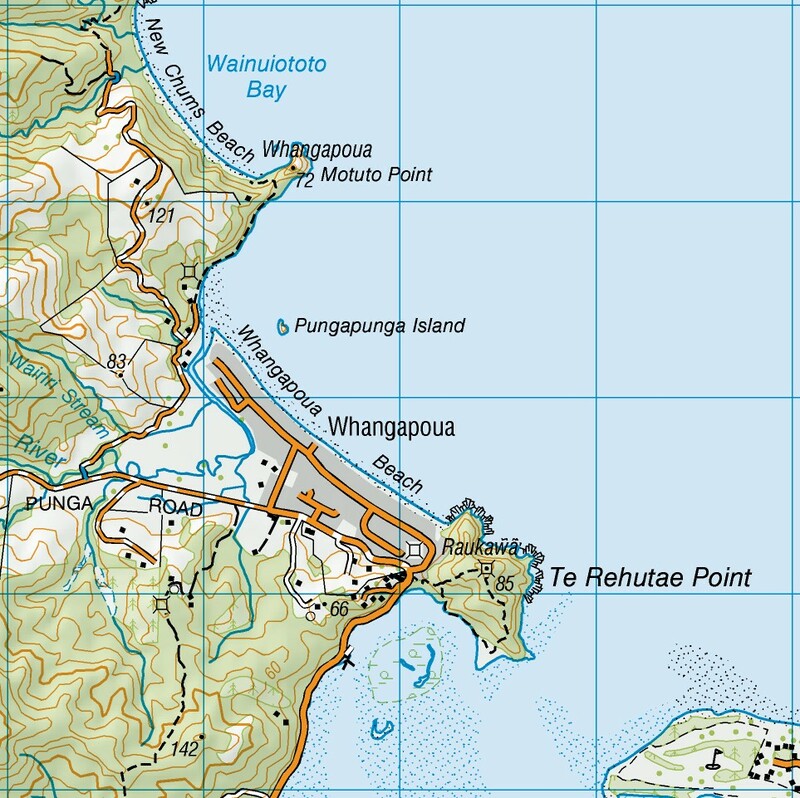 A topo map of the area covered, as well as the Opera Point and Raukawa Pa walk. The walk was done on August 30, 2015. 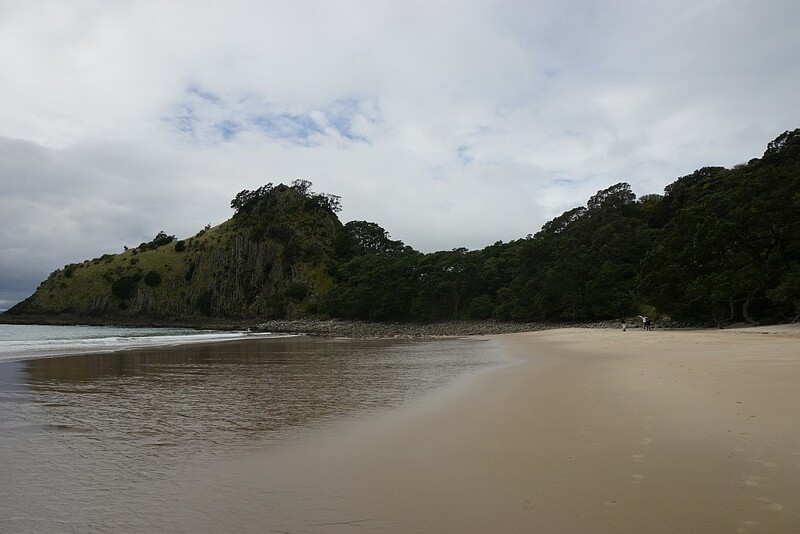 This entry was posted in Walks and tagged Coromandel, Motuto Point, New Chums Beach, Wainuiototo Bay, Whangapoua on 2015-09-04 by nzartig.